We love polls here at DL. It gives us a great sense of how you all feel about certain topics and that is something we care a lot about. 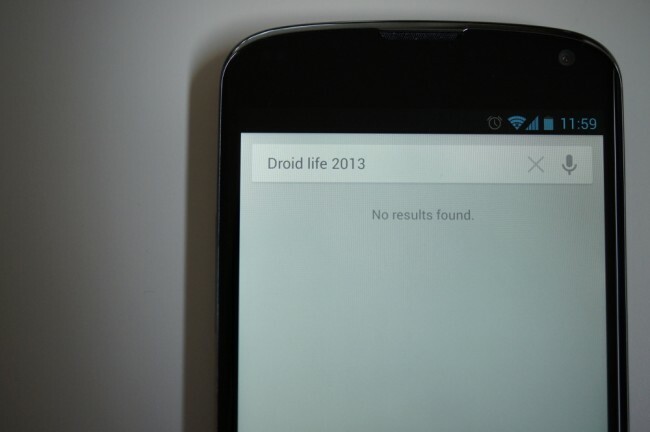 Last year, we did a sort of “Look Back” at Droid Life through polls and it was a really interesting post. So, we have decided to bring it back this year too. 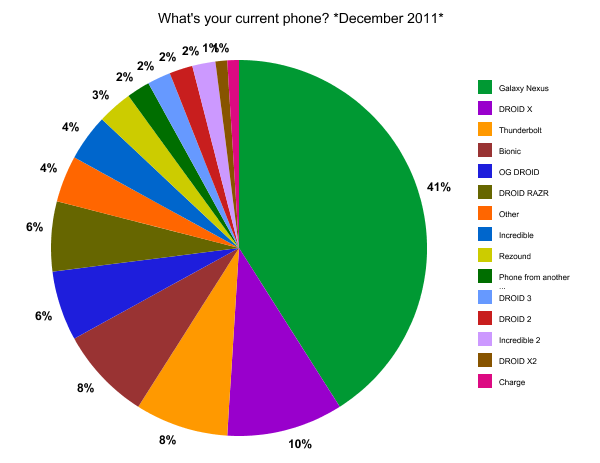 In general, 2012 was a huge year for Android. When it came to phones, the Galaxy Nexus still reigned supreme in people’s pockets, quad-core devices and Jelly Bean took over the spec pages, and we found that people still have to have root access. We were introduced to a whole new Nexus lineup of devices, Verizon’s tiered data, and fancy new display technology. And please, excuse my crude graphs. What is your current phone? What’s more important than knowing which phone each of you have? 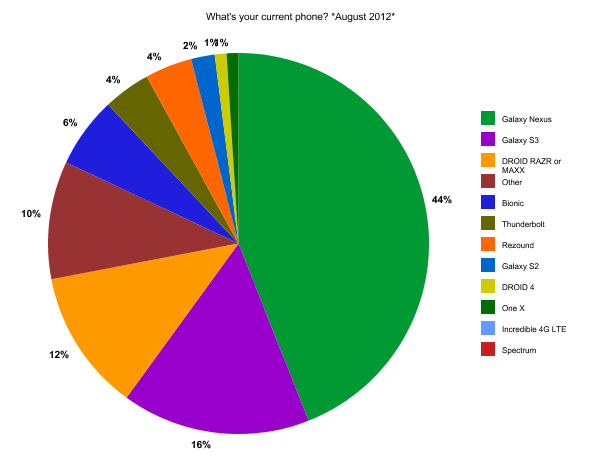 Crazy enough, the difference between ownership numbers between phones from December of 2011 to August of 2012 was pretty much directly related to the introduction of the Galaxy S3, which kicked a few devices off of the list completely. 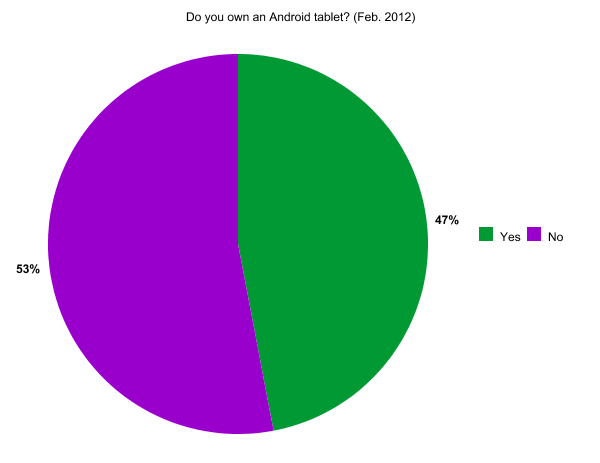 We asked readers what they thought 2012 would mean to Android back in January of this year. Warning, the answers may shock you. We still believed Honeycomb was going to be the future of Android tablets, but we nailed it with the excitement over quad-core devices. 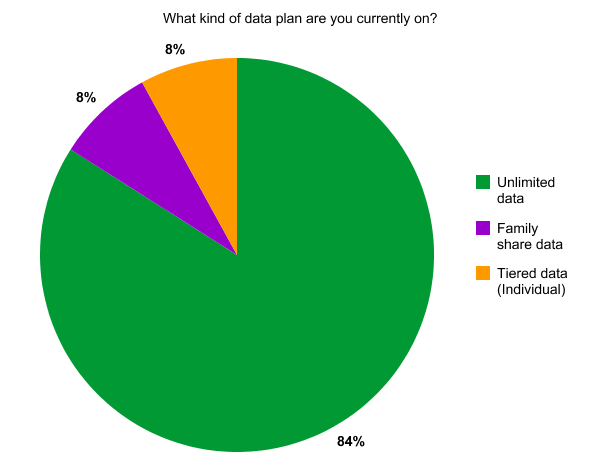 Unfortunately, we still didn’t know Verizon had Share Everything plans on the way, which took a nice chunk of our recent “What was 2012 the year of?” poll. One of the pivotal questions that we ask our readers every half year or so is if their device is currently rooted or non-rooted. With devices coming straight from the factories with plenty of power and a much better looking UI then they used to, the needs for rooting are sadly fading away with the days of Gingerbread and Froyo. 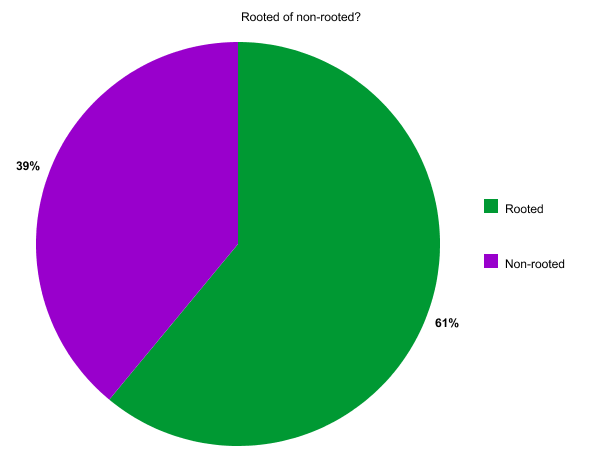 Google is continually making Android look and perform better with each new release, but according to our readers, they still want the root! Do you own an Android tablet? Interested in the Nexus Q? So, not everything Google puts out can be a hit, right? We basically saw what happens when Google releases a product that is overpriced and theoretically doesn’t do anything besides weigh a ton. Sorry, Nexus Q. Maybe Google can go work on you a bit longer and add some real functionality besides streaming YouTube videos. 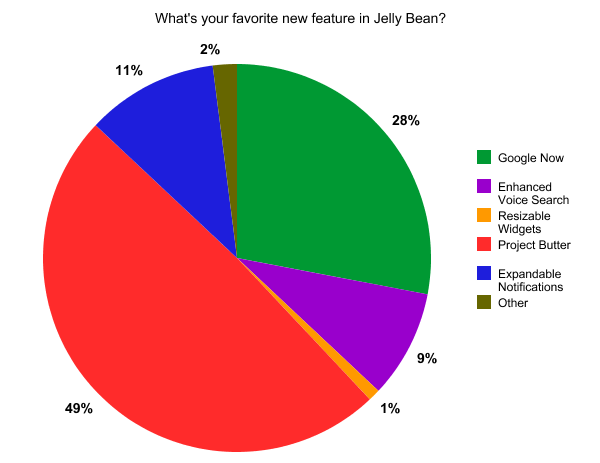 What’s your favorite new feature in Jelly Bean? 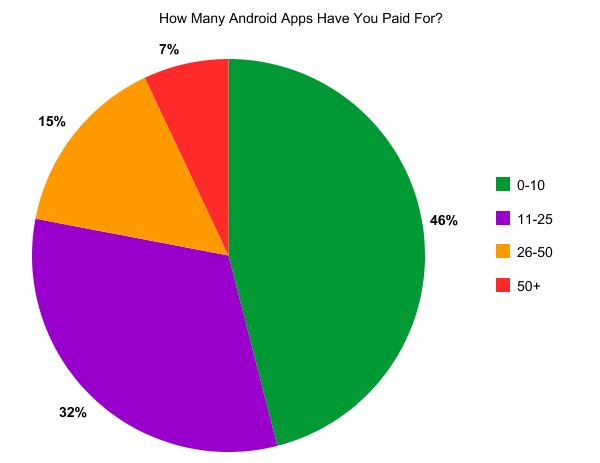 This year, we were able to see that the Android group is sort of a cheap bunch. No offense, but look at these numbers. 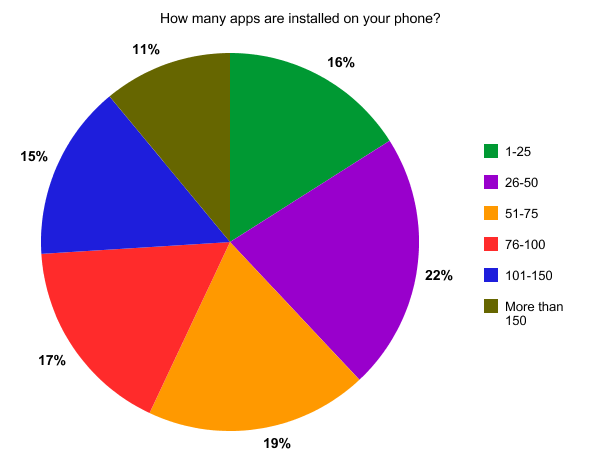 Now, there’s no way to directly correlate the folks between the two polls, but out of the almost 10,000 people that answered these, a whopping 46% of people have only “0-10” paid apps. Let’s go support those developers, folks! If you play a game that you enjoy and there’s a paid version, let’s convince these developers to keep working. 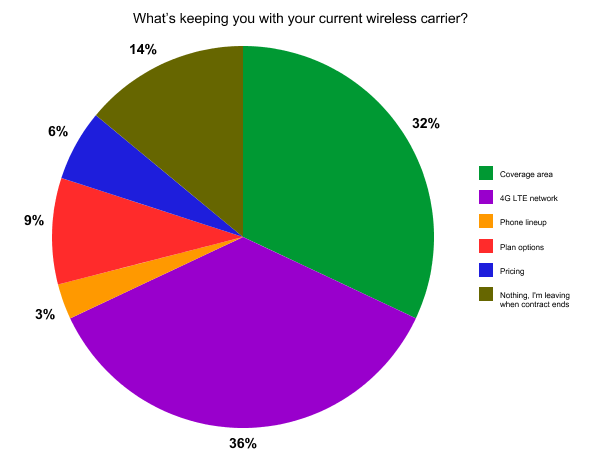 What’s keeping you with your current wireless carrier? We talk a whole lot about carriers on the site. With the introduction of tiered data, new phones, and 4G LTE data, we need to know what’s keeping you with your current provider. 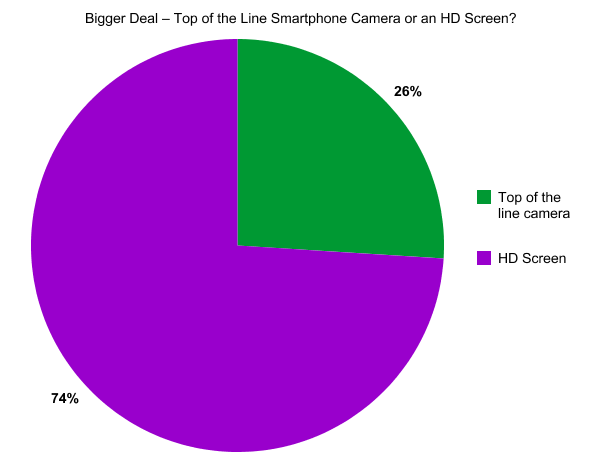 The people have spoken, and it isn’t so much the grandfathered data hogs that have spoken. People want good coverage and fast speeds. To top it off, we needed to find out what kind of plan you’re currently on. No surprise here! The DL community doesn’t rock anything unless it’s unlimited! How much data are you actually consuming? 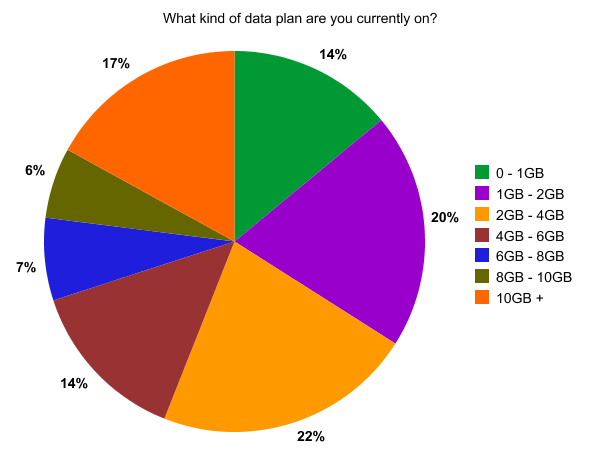 So, now that we are able to see what plan you are on and what you’re loving about it (4G LTE), we set out to see how much data we’re actually consuming. 2GB to 4GB was on top, but definitely not by much. In third came 10GB+ with 17% of the vote. Now that’s a data hog right there. We’re huge hardware fans and we love to talk about mobile processors, RAM, and all of that jazz. What makes it even better is that all of you like it too! 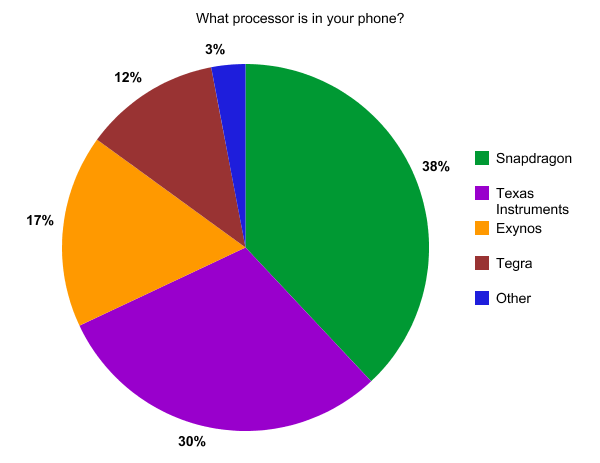 Recently, we asked which processor was in your phone of choice. Being that many of you are on Verizon, Snapdragon had no issues pulling out that win. 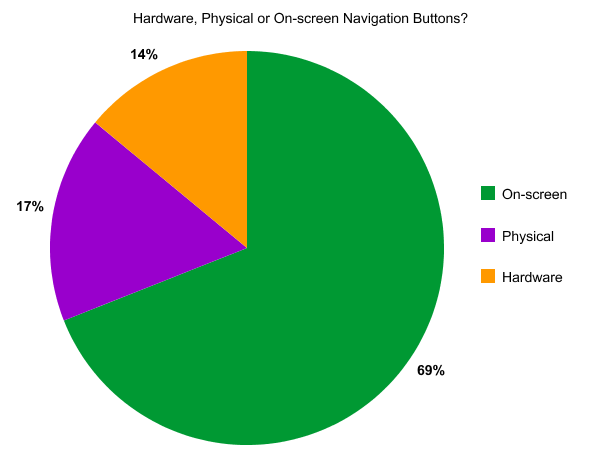 But what about on-screen keys and things like that? Let’s take a look at what the DL community was digging this year in terms of hardware and specs. To sum it up, we have had a very exciting 2012! We look forward to 2013 and everything it has to offer the Android community. We have CES in Vegas, MWC in Barcelona, more 1080p devices, more Google I/O, whatever Samsung is working on, new leadership at Motorola, and so much more. Thanks to all of our readers for being the greatest group of Android lovers out there. 2013 should be a blast! Report: Motorola and Google are Designing the "X Phone"